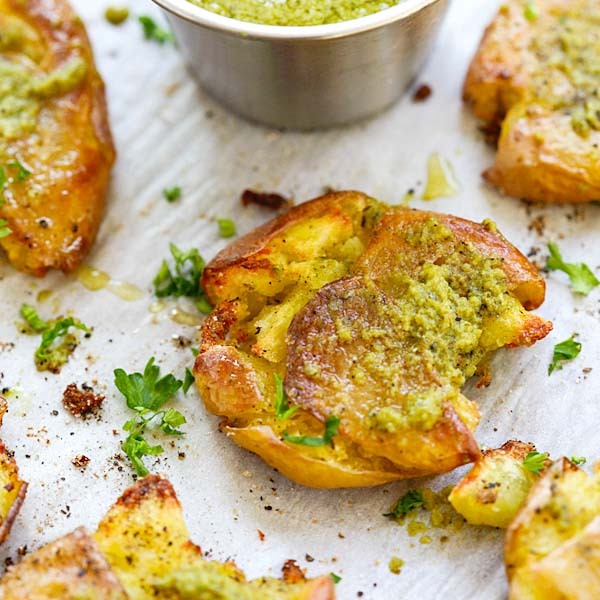 I made this garlic herb butter for the hasselback garlic cheesy bread recipe. While you can get garlic herb butter from the store, it’s so much easier to make it at home. The recipe practically takes 10 minutes and you have your homemade garlic herb butter. As I mentioned, I made it for the garlic cheesy bread, but ended up using it for many more dishes, such as garlic noodles, brushing it on grilled shrimp, or just plain on my morning toast. 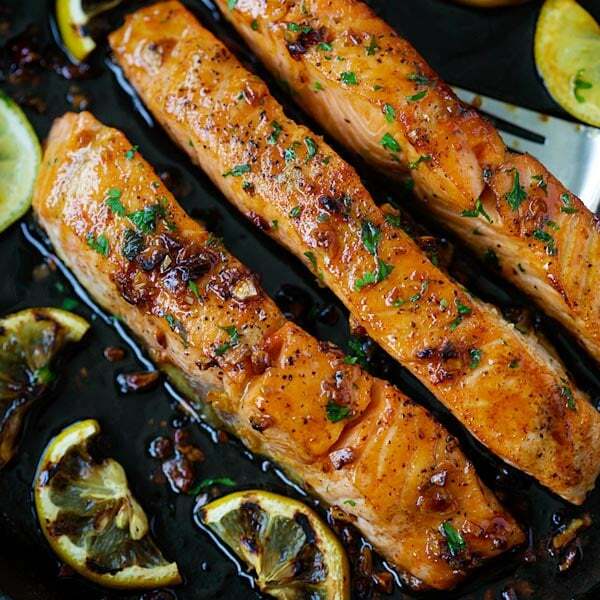 It adds a great garlicky and herb flavor and make everything so much better and palatable. The best thing is that garlic butter will keep forever in the fridge, just like your regular butter. 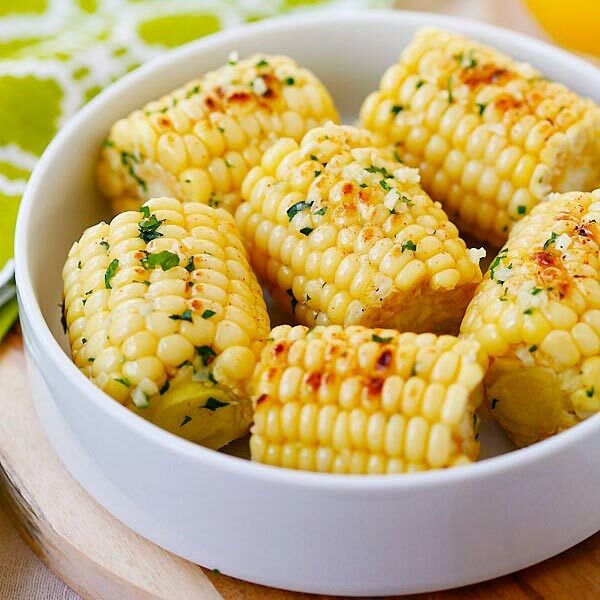 Check out the recipe on how to make this garlic butter, it’s super easy. I get excited thinking of the endless possibilities! How to make Garlic Herb Butter. Learn the picture step-by-step, so easy to make and you can make so many dishes from it. Using a hand mixer or stand mixer, beat the butter and salt and beat for a couple of minutes, or until fluffy. Add the garlic and parsley, stir to combine well. Transfer the the garlic herb butter onto a sheet of plastic wrap, roll up to form a cylinder shape. Twist both ends tight and keep it in the refrigerator. They are ready to use when the butter becomes cold and solid. All photos and recipes on Rasa Malaysia are copyright protected. Please do not use the photos and recipes without prior written permission. If you wish to republish this recipe, please rewrite the recipe in your own words instead of copy and paste and link back to //rasamalaysia.com/garlic-herb-butter/. Thank you very much! That would taste amazing in my potatoes. Sounds like a good recipe for a flavoured butter that would have multiple uses. Will definitely try it. How many grams is a stick of butter? Garlic Herb Butter tastes fantastic when you put a bit of it on a Steak. Ribeye or New York are the best. You just simply add a good slice on the steak as you serve in on the plate. It is also great for a topping for a Baked Potato. is this measurement regarding fresh or dried parsley? so pretty your butter!! Fresh. Thanks for your sweet comment. This looks good…but what are the directions? I’m new to cooking, lol. How much “herb”, butter, & garlic? Do you melt the butter? Do you use room temp butter? The garlic-whole, minced, small chunks, how much, raw, cooked, ect? Also is there a spice called “herb” or does herb have a different name? Have you tried this with homemade butter? I’m wondering if the turnout will be the same. I haven’t tried homemade butter. 4 big pips…and minced very fine. You can use a few more, up to you…either way is fine. So easy and delicious! Thanks for sharing! can you use dried parsley as a substitute for the fresh? how much would you add then? can’t wait to make it, thanks so much! Can you freeze the garlic butter, and for how long? Yes you can freeze it for a few weeks. Thank you, Rasa Malaysia, for providing this very easy recipe—it really has so many uses! If fresh parsley and garlic are not available, dried parsley flakes and garlic granules can be substituted, plus the shelf life may even stretch a bit longer if stored in an air-tight container. Bon appétit and happy cooking! I added more garlic, great recipe though. Excellent with fish, steak or on bread. Use your imagination. Yes yes more garlic is better. Thanks for trying my garlic herb butter recipe. We buy a version of this but it’s not available where we are right now, so I might try my hand at making it again. Our favorite way to use it is to get a foil pan, coat the bottom with butter, add tater tots and put more butter on top, then add the pan to the grill. Turn the tots over individually part way through and enjoy! 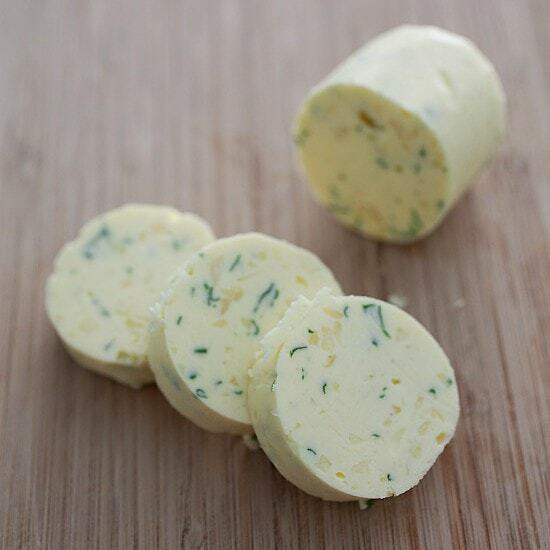 I WOULD LOVE TO MAKE THIS HERB BUTTER IF I COULD GET THE RECIPE. THANK YOU…. The recipe is where the red button is. It says GET RECIPE. I tried this recipe and it’s great! The only problem is that I think 0.5 teaspoon of salt might be too much and I think I’ll quarter that amount (plus add more garlic) the next time I try this recipe. Can I just used salted butter and not add the salt?